Famous for its breathtaking architecture and its champagne bar, St. Pancras is one of the world’s great stations. Built by the architect Gilbert Scott in 1865, the facade is a London landmark and the train shed behind it, designed by William Barlow, was started soon afterwards. After many years of relative decline and the threat of closure, the station has been transformed and enlarged as the terminus of Britain’s first high speed route, that carries Eurostar trains to and from Paris and Brussels , and also high speed trains to Kent. 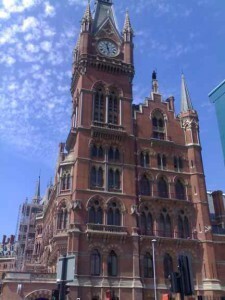 In 2007 the station was re-opened, and Eurostar international train services started leaving from St. Pancras. It is also London’s gateway to the East Midlands and Sheffield, and two underground platforms serve the cross-London Thameslink route from Bedford to Brighton. There are numerous shops and a range of food outlets. This is not a place to shop for bargains but a visit offers a combination of shopping and the chance to enjoy refreshments in spectacular surroundings. 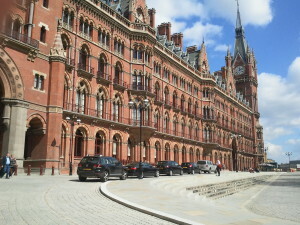 The spectacular St.Pancras Grand Hotel is an integral part of the station and is now a luxury hotel, just as it was when it was opened by the Midland Railway. For Harry Potter fans, in front of the station, just inside King’s Cross, there is the famous “platform 3/4”. Everyone has the opportunity to take a picture with the shopping trolley and Harry Potter’s scarf.